Every woman wants to flaunt soft and pink lips. Beautiful lips make your smile even more pretty. But, when the lips become pigmented and dark, it just takes away from the beauty of that smile. 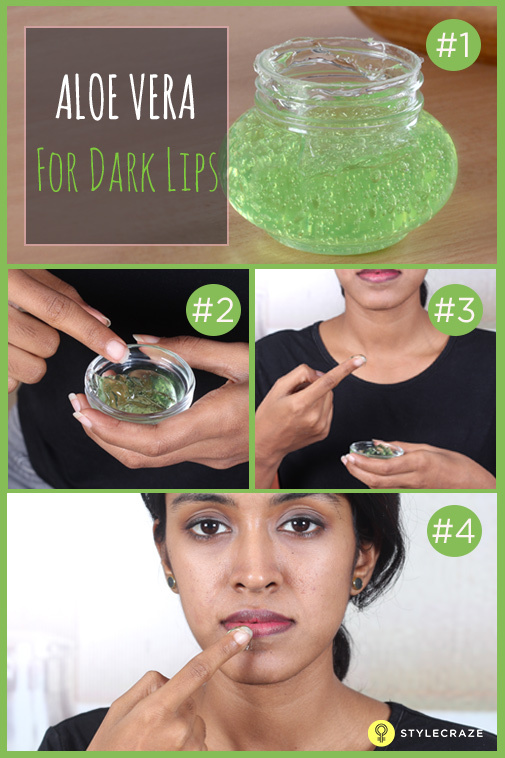 lip scrubs and peels, you can make some easy lip packs yourself to remove the dark and ugly pigmentation. 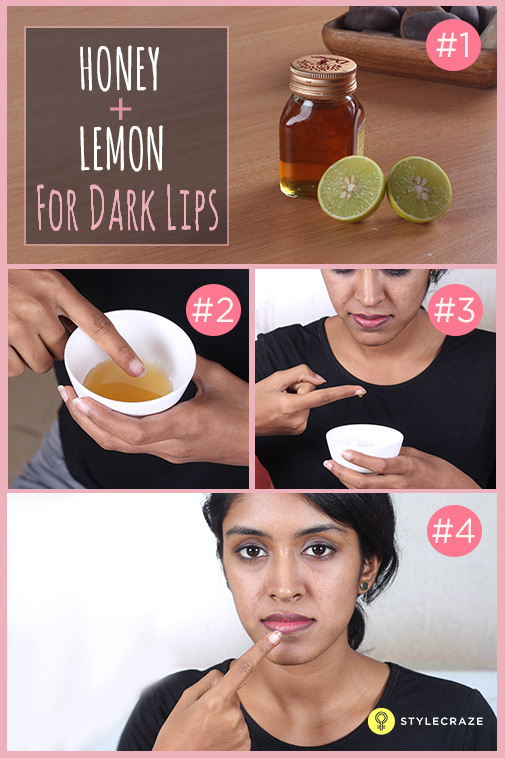 Keep reading to know more about the natural remedies on how to lighten dark lips naturally. 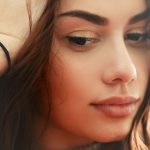 How To Get Rid Of Dark Lips Naturally? 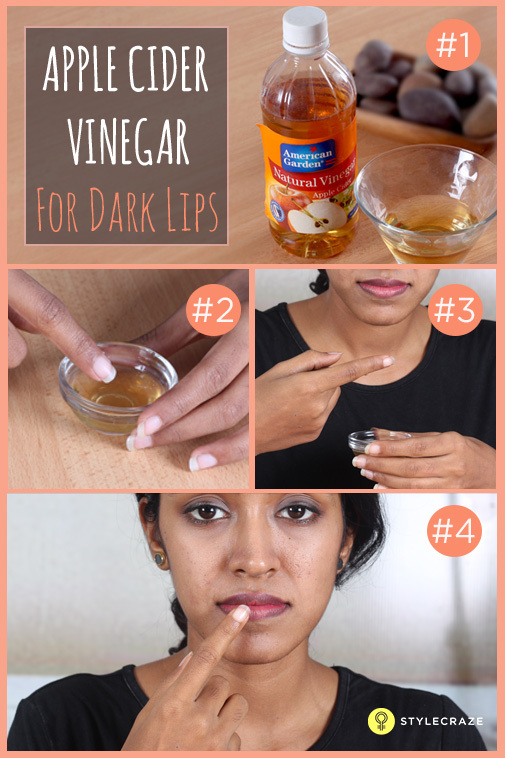 Here are some tips and recipes you should follow to lighten your dark lips. 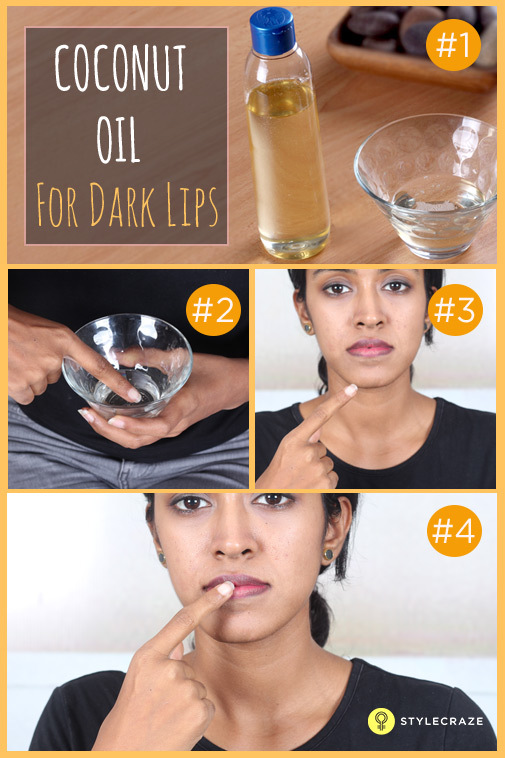 Use coconut oil as a lip balm during the day. Apply a tiny amount and spread it out with your fingertip. Apply coconut oil before going to bed as well. Reapply coconut oil as and when required throughout the day. Coconut oil contains essential fatty acids that keep your lips healthy and hydrated (1). Replenished lips will be soft and pink. 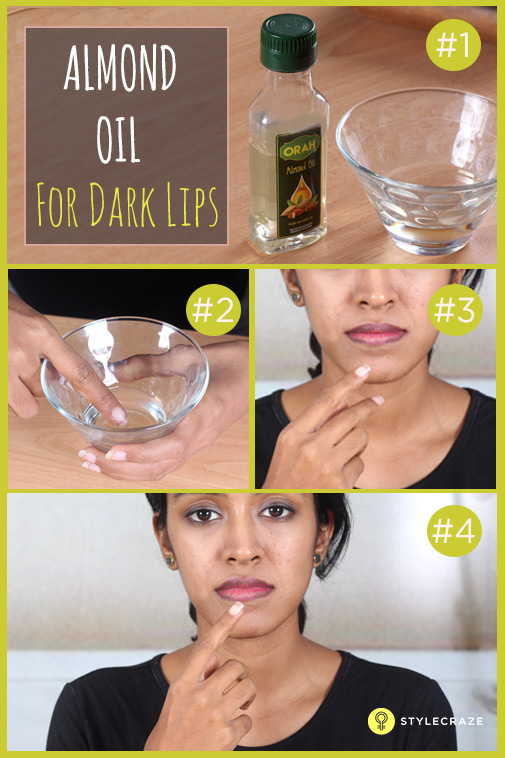 Take a drop or two of almond oil on a finger and massage this on the lips for a minute or two. Apply almond oil every night before going to bed. The emollient properties of almond oil will smoothen and rejuvenate the skin. Its sclerosant properties help to lighten the lips, thus reducing discoloration (2). Mix the lemon juice and honey to make your tan removing lip serum. Coat your lips with this serum and leave for an hour before wiping off with a soft, wet cloth. This process can be done a few times in a day to remove tan and pigmentation. 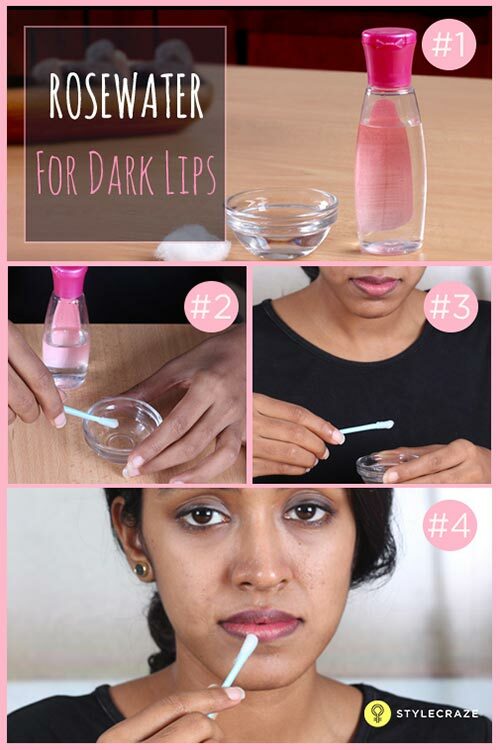 This is the perfect dark lips treatment that you can do at home. The citrus extracts from the lemon juice remove the tan and honey nourishes the lips to make them pink (3, 4). This serum can be refrigerated and used for a week. Apply glycerine over your lips with a cotton swab before going to bed. Other than exposure to the sun and improper maintenance, dryness might also cause pigmented lips. This glycerin treatment retains the moisture and prevents drying, thus helping to get rid of dark lips (5). Apply a thin layer of fresh aloe vera gel on the lips and let it dry. Repeat this once every day for best results. Aloe vera contains a flavonoid called aloesin. This polyphenolic compound inhibits the pigmentation process in the skin, thus causing lightening of the lips (6). Aloe also rejuvenates the skin and provides it with healthy nutrients (7). Dilute the vinegar in the water. Dab this on your lips with cotton and let it dry. Rinse after 10 to 12 minutes with lukewarm water. Apple cider vinegar is mildly acidic in nature due to the presence of alpha hydroxy acids. It acts as a natural lightening agent and will remove the pigmentation from the lips (8). Do not use apple cider vinegar as an overnight application as exposure to its acidity for such a long period of time may damage the skin. Mix some water with the baking soda to form a paste. Apply this paste on your lips and scrub in a gentle circular motion with a toothbrush or your fingertip. Scrub for two to three minutes. Rinse thoroughly, pat dry, and apply a lip balm or some olive oil. Use the baking soda scrub every alternate day. The darkness of the lips can be due to the accumulated dead cells. Baking soda exfoliates and removes these dead cells and brings healthy and pink skin to the surface (9). The lip balm or olive oil is important to keep the lips hydrated after exfoliation. Slice the beetroot and store in the refrigerator. 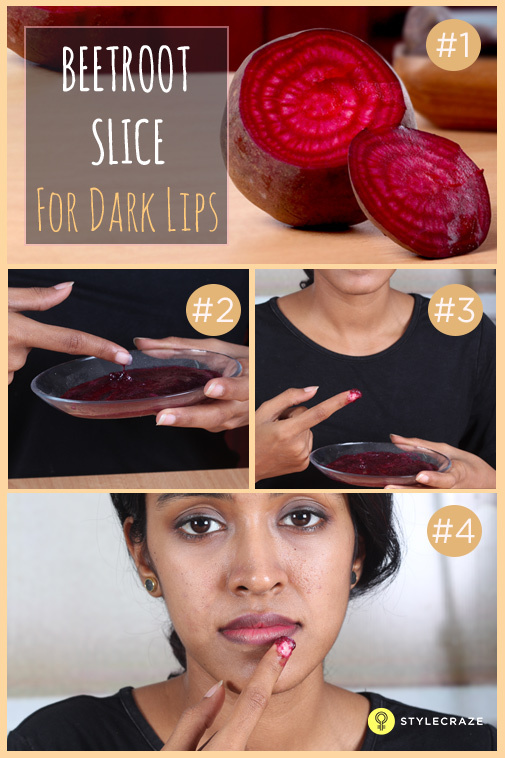 In your leisure time, scrub a cool beetroot slice on your lips for a couple of minutes. You can wash the beetroot juice after 15-20 minutes. The juice that oozes out of the beetroot and onto your lips will remove the tan from the lips naturally and color your lips too. It cleanses the skin and keeps it supple. Its antioxidants will also keep the skin young and healthy (10). Pink lips are all yours in a few days. Blend half a cucumber to make some fresh cucumber juice. Cool the juice in the refrigerator. Dip the cotton ball in the cool juice and apply the juice on your lips. Keep it on for at least 20 to 30 minutes and then rinse it off. Do this religiously once every day and you will notice results in 15 to 20 days. 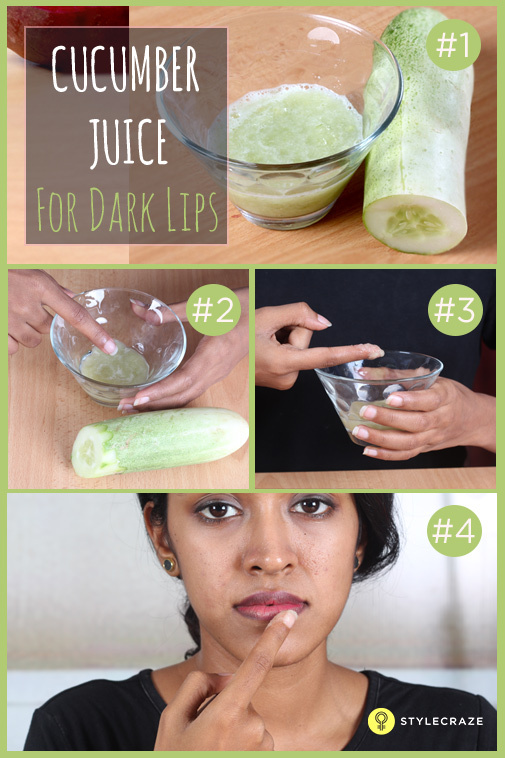 The daily application of cucumber juice will rejuvenate your lips and also help to lighten them (11). It is also soothing and nourishing for the skin (12). Dip the cotton ball in the rosewater and apply it on the lips. Rub the cotton gently on the lips a couple of times. Leave the rosewater on and go to bed. Clean your lips every night with rosewater. Rosewater stimulates blood flow to the lips and nourishes it. It brightens the color of the lips and also enhances cell renewal (13). These remedies are simple enough to include in your daily routine and can be easily done during your leisure time. Let us look at the causes of dark lips. Don’t just stick to the topical treatments listed above. You also need to take care of your health to achieve beautiful lips. Drinking at least eight to 10 glasses of water every day in order to prevent dehydration, which also causes dark lips. 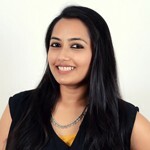 Avoid using local brands and wholesale lip products on your lips. 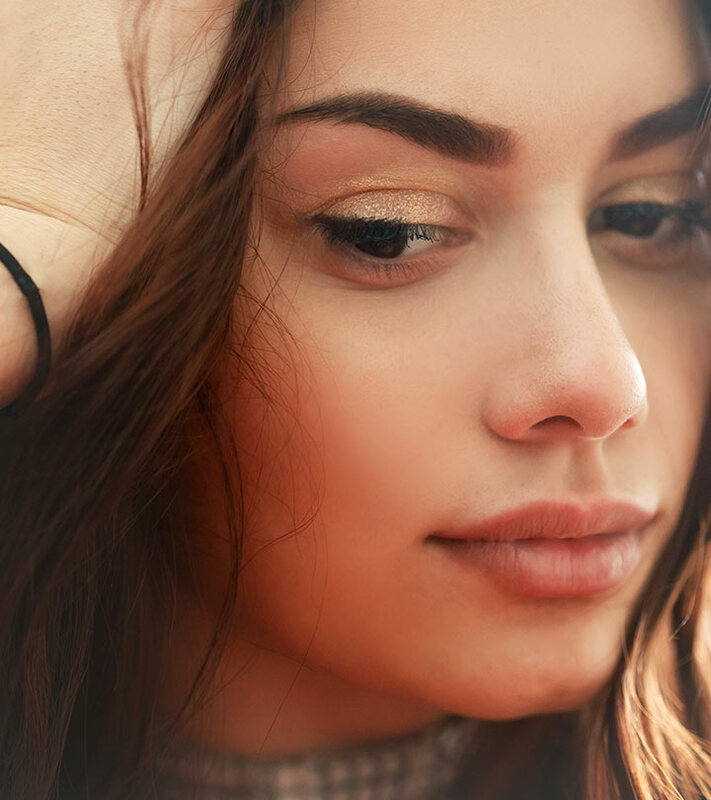 Use a mild herbal lip balm instead to achieve soft tan-free lips. Using fresh pureed fruits as lip masks works wonders in removing sun tan and pigmentation. So, welcome fruits in your regular lip care routine. 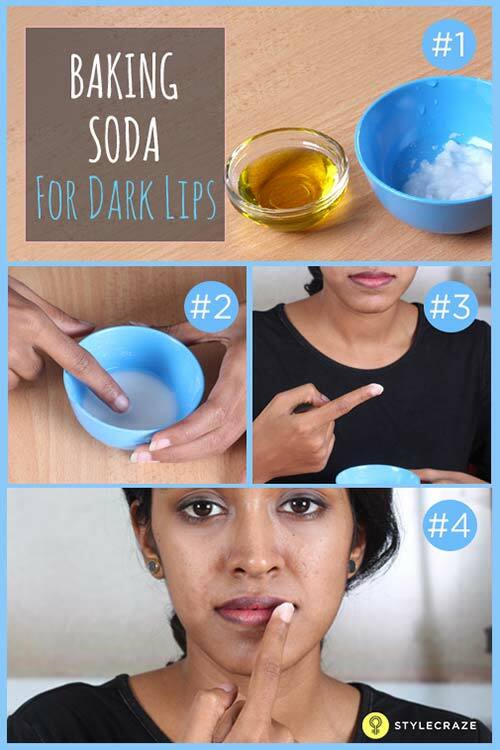 Just follow these tips on how to get rid of dark lips naturally. Also, don’t miss our article on how to avoid getting dark lips.